Dorothea Lasky’s third poetry collection, Thunderbird, begins with the lines “Baby of air / You rose into the mystical / Side of things”—which immediately prompted me to hum Van Morrison’s “Into the Mystic.” It wasn’t a great start to reading this book, but what I realized was that it wasn’t the word “mystical” that brought a song to mind so much as it was the lyricism of Lasky’s writing. As I hummed on, I recognized that the language of “Baby of Air” works through patterns, creating emotion tenor through lines that build on each other. A few lines later, Lasky writes, “People cannot keep air in / I blow air in / I cannot keep it in.” These lines are not typical, flowing lyrics packed with sound play, but are instead a series of seemingly simple phrases that amass meaning through repetition. 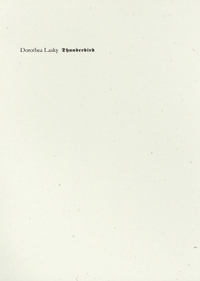 At times, Lasky’s lyricism even has a blues-like effect in lines like “O you are already there / O you are already there / My brother tells me, you are already there.” Even in this opening piece, poetic lyricism and song come together to form both voice and emotional resonance to carry the reader through the rest of the collection. However, Lasky’s language does not end at simple repetition. Mixed with this lyric quality (and sometimes at odds with it) are straightforward statements that strike the reader through their baring of the intimate. At times, this approach takes on the negative association of confessionalism—the self-indulgent statement of personal emotion that shuts out the reader—however, at Lasky’s best she filters this private emotion through straightforward statement, creating for the reader a realistic portrayal of human (universal) feeling. To explain—in poems like “The World Doesn’t Care,” Lasky uses an easy refrain, writing, “The world doesn’t care / But I care // The world doesn’t care / But I do.” The poem only relies on repetition; the language doesn’t build, it just echoes. I am not arguing that this technique leads to a “bad” poem, just one that doesn’t reach the intensity that some of Lasky’s other pieces achieve. Similarly, the opening to “Death and Sylvia Plath” states, “My student in the city college / Really likes the poems of Sylvia Plath / She is writing her research paper about / Lady Lazarus.” Lasky’s anecdotal tone here feels like an easy opening that I want to skip over in order to get to the crux of the poem. Once again, the issue lies in the fact that Lasky is only using one technique, here, simple, personal statement, instead of combining her techniques to create greater intensity. Here, Lasky gives us personal thought without indulging in interiority by exploring (not answering) universal questions, such as wondering what “love” is. Though the confessional mode of an “I” and a “you” exists here, Lasky opens the poem beyond a private sphere by giving the reader simple statements we can connect to like “Love is something that is too confusing.” Furthermore, she uses repetition to create intensity and complexity within these thought processes though phrases like “I will think instead of yoking…I will think instead of clouds.” By combining these techniques, Lasky constructs intricate poems that reflect the human mind with all of its ambiguities and conflicting emotions. If these lines sound self-indulgent, overly dark or over-the-top, I would argue they are doing this purposefully. By evoking Plath, Lasky is able to question an entire history of the poetic “I,” the place (within the confessionalist mode) where the poet, and the poet’s projected self, come together. In this way, allusions to Plath do not merely add dimensionality to Lasky’s poems but serve to reflect this evaluation of “dead” language, “dead” speakers, even “dead” writers and readers.